If you didn't go to work this Thanksgiving count yourself one of the lucky ones. Target stores opened at 9 P.M. on Thursday night, a full three hours earlier than they opened in 2011. 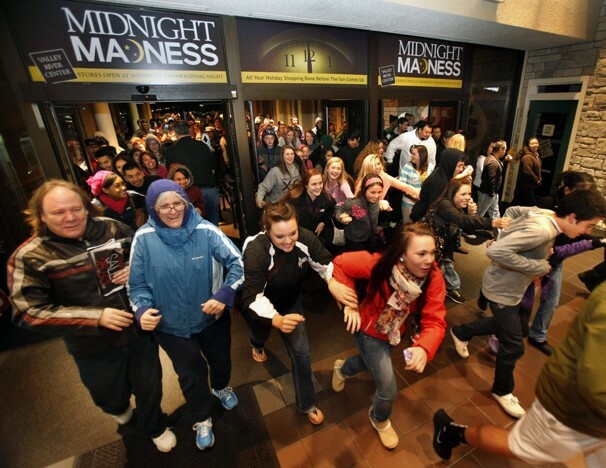 Worse, other big boxes like Toys R' Us and WalMart began their Black Friday sales an hour earlier this year at 8 P.M. It's the new normal, or what's beginning to pass for normal. Days off are becoming half days off, Black Friday is creeping into to Thursday. Increasingly store employees are being asked to give up their hard earned holidays with their families to arrive at work on Thanksgiving, hours before the stores even open. Later, they'll probably run into their own relatives bargain hunting in the aisles. Forget the turkey dinner, pass me that discounted HDTV Mom. When an unstoppable force (bargains) meet an immovable object (low wages) chaos is increasingly the result. Those viral videos that you see of American crowds rioting as they scramble for an elusive bargain aren't just proof of how hard times have become here, they're also a reminder that thats to draconian corporate practices they're actually getting worse. The big box stores are themselves part of the problem, that is. At Walmart, the employees the company euphemistically calls “associates” make an average of slightly more than $10 an hour. So if they work a full 40 hours a week - and many don't due to its employment practices - they get paid about $1,700 a month, before taxes. From that they are supposed to pay for their food, their rent, their clothing, their medical care and possibly even their children too. So I guess they have to less to give thanks for, it's no wonder they're willing to work on that night. Meanwhile Walmart accounts for more than 10 percent of all of the retail sales in the country. In fact it is the largest private employer in the world, but in the US it still doesn't have a union. That's intentional. In Canada in 2005 WalMart actually closed a store that voted to create one. Recently in Florida WalMart fired an employee who had dared to talk about unionizing. When the man returned to the store a few days later to say hello to his old friends he was handcuffed. How's that for the land of the free? Although WalMart's employees comprise barely 10 percent of its cost of doing business, the company still exploits them. A 2004 study at the University of California, Berkeley claimed that Walmart's low wages and benefits are insufficient to make a living on, and so California taxpayers still pay $86 million a year in state aid to Walmart employees. Who's making out here? Customers, increasingly anxious to make their wages stretch, now have to weigh the doubtful working conditions at big box retailers with their own bottom line. That kind of realization can lead to a feeling of hopelessness. Those rioting crowds are really just a symptom of a much deeper malaise, one that won't be cured by waiting on WalMart's executive board for a solution. This year a man in Texas pulled a handgun during a Black Friday bargain scuffle, making national headlines. Because this happened in Texas the local police immediately reminded the press he had broken no law and was within his rights. The message appears to be, if you really want that discounted Wii you won't just have to fight for it, you better holster up. It's Wild West capitalism. So increasingly, it seems, Thanksgiving is going to look like a quick pit stop to load up on carbohydrates before you holster up and fight for your share. You and 41 million other shoppers will have to muscle in on an increasingly narrowing pool. At a WalMart last year a woman pepper sprayed the crowd to get her hands on discounted video games. Two years ago gunfire broke out at a Toys R' Us, killing two people. In 2008 a WalMart employee was trampled to death as thousands of shoppers raced into the store, stepping on him. If you're worried about retailers crossing the line and spoiling the meaning of the holidays you're already late to the party. Store employees have already launched their own petitions to ask for their Thanksgivings back. But I don't really fancy their chances of success. It's little guy workers versus the mother or father determined to get that hot toy for their kid that they otherwise can't afford. It's the desperation of the working man and woman versus the record breaking profits of the corporate shills. It's how we live now.